Anyway, the Internet gives us access to all sorts of fun stuff, and it doesn't always have to be interactive to be a context for therapy. Check out MiniLand Zoo, a fabulously huge and detailed zoo posted on the MOCpages website, dedicated to sharing LEGO creations. Steef de Prouw created a zoo with all the expected elements, as well as some humorously unexpected details. There are approximately 40 photos of the zoo posted on the site; your kids will want to get busy building their own! I could see this site functioning almost as (or pairing well with) a picture book on zoos. Such a context lends itself to completing a setting map, categorizing animals within a zoo, creating a story based on the pictures, or conversation work. 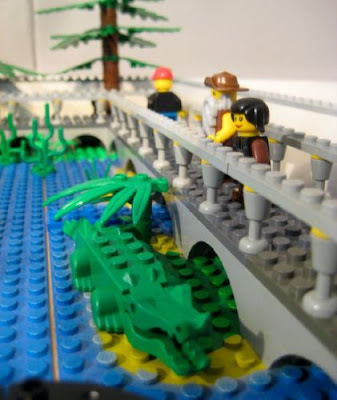 Also, check out this great article on the link between LEGO and literacy. Thanks @SLPTanya! Thanks to Neatorama for featuring this link. Thanks for linking to my blog. We also love LEGO too!